Only five miles separate the Elmwood Village from the Seneca Babcock neighborhoods, but when it comes to voter turnout in School Board elections, the two couldn’t be farther apart. While fewer than one in 10 registered voters citywide typically vote in School Board elections, the turnout ranges dramatically from one neighborhood to the next, a Buffalo News analysis of School Board election data found. The last time Buffalonians elected at-large members to the School Board, in 2009, nowhere was voter turnout higher than in the Elmwood Village. In one section of that neighborhood, in fact, turnout was 10 times higher than it was in Seneca Babcock, the neighborhood with the lowest voter turnout. Student performance in the city schools has been sub-par for years, yet voter turnout for School Board elections has limped along in the single digits. This year, the district’s situation seems even more dire. While the superintendent reports nominal increases in graduation rates and attendance, and decreases in suspensions, three out of four Buffalo schools have been dubbed failing by the state. Parents and state officials are demanding that the district find schools in good standing for more than 1,500 students who were denied the chance to transfer out of low-performing schools. Some wonder if the increased community concern about the city’s public schools this year will translate into greater voter engagement in more than just a limited area of the city. Throughout much of the Elmwood Village, more than 15 percent of registered voters went to the polls five years ago, election data shows. While that turnout is dismal when compared to general elections, it was far and away the best in the city for School Board elections. Among the nine Common Council Districts in the city, the Delaware District – where most of the Elmwood Village is located – accounted for one out of every three votes cast five years ago. In Seneca Babcock, fewer than 2 percent of registered voters cast ballots five years ago, the last time an at-large race for the School Board occurred. Paul Ramos, a lifelong resident of the neighborhood, doesn’t get his news from CNN – he’s more of a Bill Maher kind of guy – but he’s better informed about current events than most people his age, by his estimation. When it comes to Buffalo School Board elections, though, the 27-year-old father of two does what most Buffalonians do. He sits them out. In many ways, the neighborhoods with the highest voter turnout are almost identical to the areas with the lowest turnout. Consider the similar profiles of the Elmwood Village and Seneca Babcock. The median income in both areas is around $35,000. Around 18 percent of the people in each neighborhood lives below poverty. Four out of five people are white. What sets the two neighborhoods apart? Education. In the Elmwood Village, well over half the adults have earned a degree after high school. About one out of four adults there have earned a graduate or professional degree, beyond a bachelor’s degree. “You’ve got a lot of teachers there, a lot of educators. They understand the importance of education,” said George K. Arthur, the former Common Council president who has carefully observed voter turnout in the city for decades. 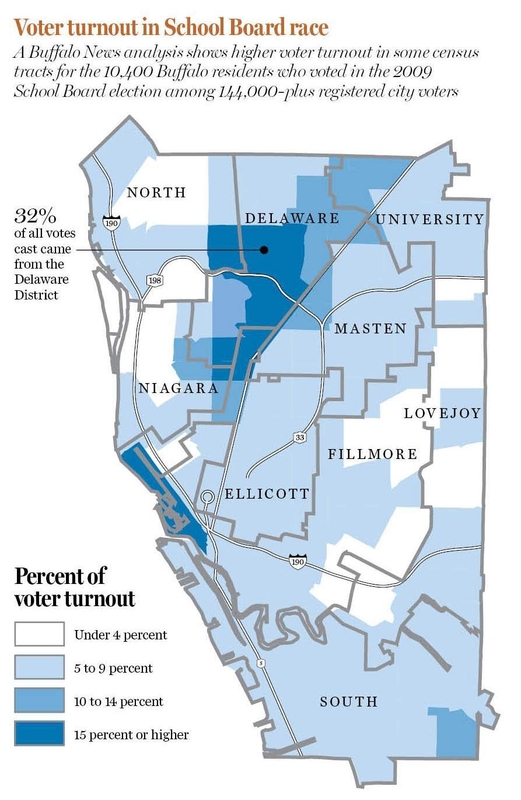 Seneca Babcock, the neighborhood with the lowest voter turnout, is also the neighborhood in Buffalo with the lowest percentage of adults who have continued their schooling past high school. There, fewer than one out of 10 adults have earned a degree after high school. Fewer than 5 percent of adults earned a bachelor’s degree. And only one out of 200 adults holds a graduate degree. “People who are educated tend to be more aware or tend to be more involved. That’s all elections, not just the School Board,” said Mickey Carroll, assistant director of the Quinnipiac University poll. Taylor, the restaurateur, met her husband when the two were attending the University of Pennsylvania. He persuaded her to leave her hometown, Philadelphia, to move to his. They lived on Linwood Avenue for awhile before buying a house on Lancaster Avenue, around the corner from the current location of the Lexington Coop. The fact that they would live in the attendance zone of Olmsted School 64 factored into their decision, as it does with many families who buy a house in that neighborhood. Several years later, their daughter was accepted into Olmsted’s Spanish language immersion program. But her language delays rendered that not to be a practical option, said Taylor, 53. They decided to send her to a private school. A mixture of apartment buildings and Victorian houses – some of them still single-family homes, others divided into two or more apartments – that now routinely fetch upward of $250,000 draws a mix of academics, professionals, students and young families into the Elmwood Village. The ethos of the neighborhood is such, according to some residents interviewed for this story, that not voting on May 6 would be frowned upon. One woman, pushing a double stroller with her two young children down Elmwood Avenue one recent morning, told a reporter she’s planning to vote in the School Board election this year. Like many residents of Seneca Babcock, Ramos has lived in the neighborhood his entire life. Just a few blocks east of the recently resurrected area known as Larkinville, Seneca Babcock remains, in many ways, much as it has for generations. Clusters of modest homes surround the many factories throughout the neighborhood. Barbara Groth raised her children in the heart of the Seneca Babcock neighborhood. Now, her grandchildren attend the same schools: Lorraine Academy and South Park High School. The retired nurse’s aide hasn’t voted in a School Board election in well over 15 years. For years, neighbors here have gone to work in those factories straight out of high school. They still do. People living here are four times more likely to have dropped out of high school than they are to have earned any sort of college degree, census figures show. Ramos, the father of two, lingered in front of the Seneca Babcock Community Center one recent sunny afternoon. Inside the building, many young people were picking up free bags of groceries. Like many of them, Ramos is out of work. Most recently, he worked at a factory on Dorothy Street, grinding plastic, and at the nearby Goodwill, sorting donations. He’s luckier than most, he said, because he has only two children to support. Lately, he has grown increasingly concerned about the city schools. One of his daughters who had been attending Southside Elementary was transferred this year to Dr. Martin Luther King Jr. Multicultural Institute, because the classroom setup she needs – no more than 15 students, with one teacher and one teacher’s aide – was discontinued at Southside. Recently, the family learned that it would be discontinued at MLK after this year, Ramos said. On May 6, there undoubtedly will be that small percentage of registered voters who vote religiously, regardless of the issues or the politics of the day. Gretchen Grobe, who has worked at the Albright-Knox Art Gallery for 20 years, is one of them. What remains to be seen is how many others – who rarely or never vote in the School Board elections – will decide to cast a ballot. Count Ashley Sutton among that group. The 27-year-old waitress has never voted before, but now she has three children, ranging in age from 1 to 7.